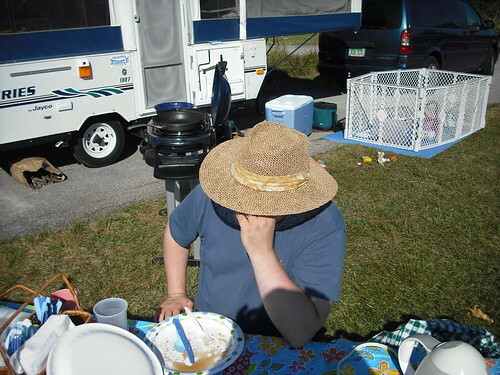 Camping with the Incognitos | Kris Johnson's Blog…sort of. Thursday morning ((Okay, in an ideal world, this would have happened Thursday morning. In reality, we didn’t leave the International House of Johnson until well after 2:00pm.)) we packed up the MVoD and headed out to the Maumee Bay State Park for a long weekend of camping. I took a great many photographs of our camping trip and would like little more than to share them with the world. Unfortunately, the family with whom we were camping is in the Federal Witness Protection Program and we had to go to some lengths to ensure that none of them were captured on the digital equivalent of “film”. I will not divulge the reason for the family’s exile into a life of relentless secrecy, but I will reveal that “Matt” once worked in Washington, D.C., and in doing so it is entirely possible that I have already said too much. Here is “Marja”. Like her father, the lass’ features must remain concealed; unlike her father, “Marja” has chosen a stylish set of sunglasses instead of a large straw hat behind which to obscure her identity. “Marja” is a traditional Finnish name that means either “beloved”, “a berry” or “a member of my family witnessed a horrible crime and I must now live in constant fear of discovery”. Finnish is a complicated language. I should point out that the barrier surrounding “Marja” is not intended to confine her, but rather to keep any would-be attackers from reaching her should the family’s true identity be revealed. 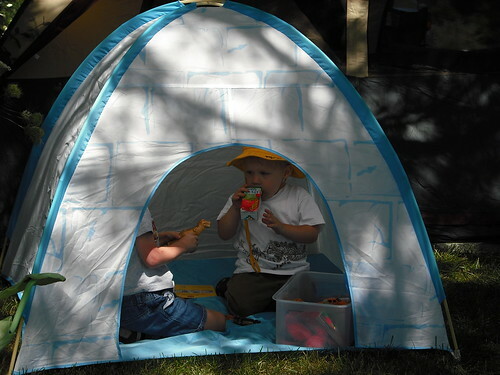 Young “Drew” (seen here hiding in Kyle’s tent) takes after his mother, proving all but impossible to photograph. He has adjusted very well to the family’s lifestyle; so much so that his nickname ought to be “Mint Jelly.” ((‘Cause he’s on the lam.)) “Drew” and Kyle got along very well for the most part and they spent most of the trip hiding from the adults. While I’m quite certain that we found Kyle and took him home with us, I cannot be sure that “Drew’s” parents found him when it was time to leave, so there is a very real possibility that the lad is still hiding somewhere around sites 221 and 222 at the Maumee Bay State Park campgrounds. By the end of our trip, Kyle had picked up some tips from “Drew” and his family. 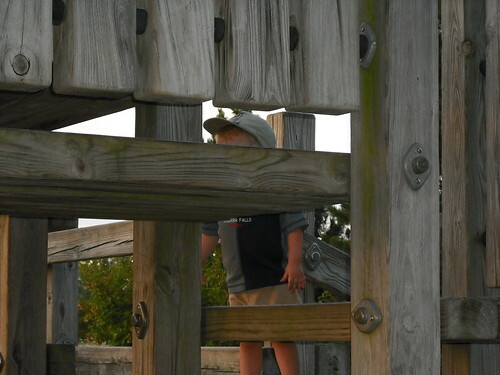 My attempts to photograph him on the playground were largely unsuccessful due to his uncanny ability to interpose objects between himself and the camera. I have since had a long discussion with him, explaining that we aren’t in the Federal Witness Protection Program because his daddy knows to keep his mouth shut and not go blabbing to the authorities every time he sees a prominent politician get whacked by an overzealous lobbyist. Upon further review, you win one (1) Internets based solely upon the mint jelly pun. @blob — I wish I could claim the pun as my own, but I heard it somewhere once upon a yesterday and cannot for the life of me remember where. If it comes to me, I will certainly cite my source. @blob — I used the one (1) Internets you awarded me to track down where I originally heard the pun. You may not be surprised to learn that it was Grandpa Simpson. I knew it was an older fella and was pretty sure it was animated, so it’s good to know that I was kinda right. Hmm…could an enterprising individual with computer savvy get a good close-up of the license plate of the minivan in the background of the pic where “Matt” is so obviously be hiding under his hat?!? Just curious…thanks for keeping “them” safe. I’m sure they will try to stay safe enough to get together again with you next year…. @“Matt” — Well, they could certainly try, but they’d find that said license plate is illegible. It should be plainly readable at higher resolution, but it appears to have been digitally obscured. Well, whose to know if that’s even their mini-van….